We love receiving cool stuff out of nowhere, and this morning I was awoken by a package delivery of an ominous metal box. What was inside? 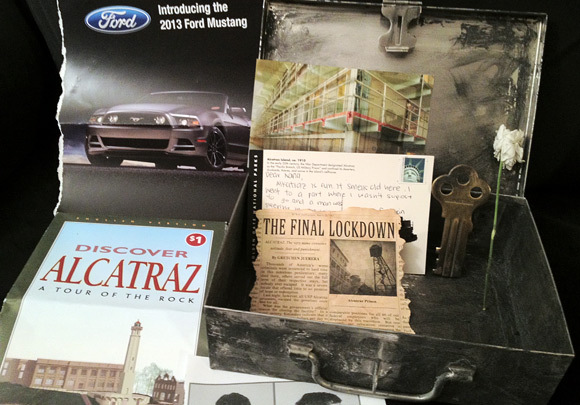 Artifacts from Alcatraz, including a map of the island, newspaper clippings, a postcard, flower (a bit creepy), photos of inmates, magazine pages and a metal Alcatraz key. It's easy to realize this a viral for that new Bad Robot TV series "Alcatraz" airing on Fox. But there's some cool stuff in here and I thought it was worth sharing, especially considering the note said: "Over the next few months, we will be looking to you, and your audience, to help us uncover the mysteries of the island." We weren't the only site to receive one of these mysterious metal boxes, as SlashFilm got one too and so did ComingSoon. This looks like the handiwork of 42 Entertainment, behind the Tron Legacy and The Dark Knight virals, as it contains a lot of clues yet to be found. 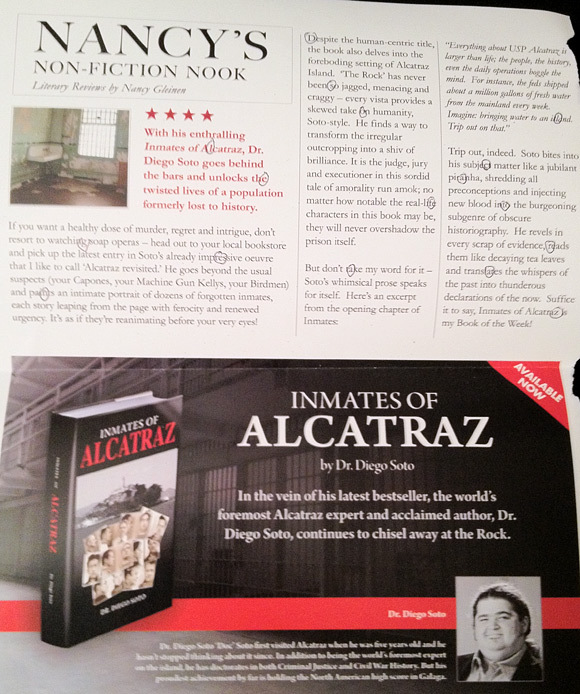 For example, on one page there's a book review (which features Jorge Garcia as author Diego Soto, from the show) that has certain letters circled that spell out "Legends of Alcatraz". You can view even more photos of the individual contents at SlashFilm as well. We're not sure how all this ties together yet, but whatever came inside of here (another J.J. Abrams' "mystery box") will certainly be important in uncovering some of the clues later on. 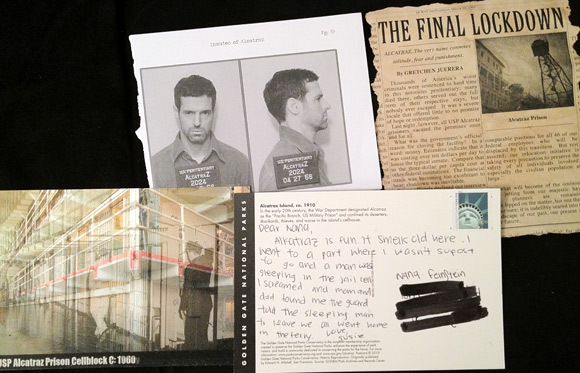 If you goto the website LegendsofAlcatraz.com all it does is forward to Fox's website for the show, which may be all the hint we need. I was invited up to visit Alcatraz in San Francisco tomorrow and expect to find out more about this viral and what everything means then. In the meantime, you can help look for clues or stay updated online. 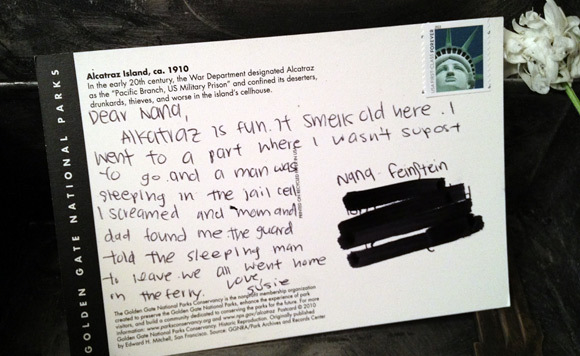 I thought that postcard (last photo) from the girl about a "sleeping man in the jail center" was awesome, not only a perfect setup, but what a great little story. I wonder if that's going to be a scene in the show? Or if that's just a little anecdote to add some eeriness to all of this. Either way, I'm intrigued. I've visited to Alcatraz before and it's an awesome place, always so mysterious to visit there and hear about all the stories. I think that's where this new TV show (with people disappearing and reappearing) will come into play, I'm curious to find out more. We'll keep you updated from here and from Alcatraz. Anyone else interested? Yea, well it's the HQ of FirstShowing anyway, isn't it? 😉 It's our primary place of work. No offices yet. Woah. Woah. Woah. There is a new 2013 Ford Mustang?! This changes everything!!! Ha ha...I can only imagine the levels of doubt and paranoia that one goes through before opening these kinds of packages. IIRC, the promotional package for Let Me In was kinda freaky (A police evidence baggy with a bloody funnel in it). just out of curiosity have u ever thought about sellin some of the viral stuff you get? Too bad the pilot to the TV show is so awful. I saw it on a JetBlue flight returning from Mexico a few weeks ago and it was full of so much bad cliched dialogue. Big letdown. And frankly, there's definitely a "who cares" factor about these Alcatraz prisoners disappearing and coming back.